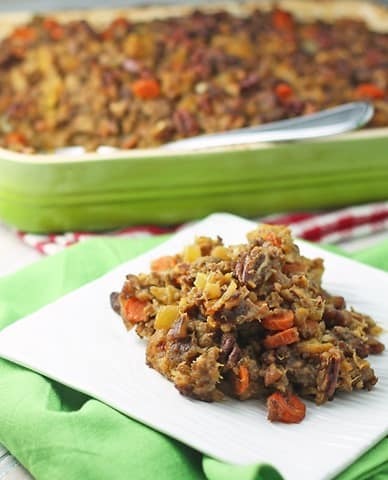 Paleo and Gluten-Free means no cornbread and without cornbread, how can I have stuffing?? By using vegetables and protein. I mixed all the ingredients and put it in the oven without the use of Cream of Crap. And Stephen agrees that it would be perfect next to a ham or turkey on the table. So, let’s get this done! 2. In a large soup pot, cook onions in butter until translucent. 3. Add the sausage and cook until brown. 4. Add the carrots, celery, mushrooms, apple, butternut squash, chicken broth, pecans, sage, thyme, salt and pepper. Mix well, bring to a simmer, and cook for 5-10 minutes or until the veggies begin to absorb the chicken broth. 5. Spray a large baking dish with oil or use butter. Add mixture to pan and cover tightly with aluminum foil. Bake, uncovered at 350* for 45 minutes. Begin checking it at 30 minutes. Mmm Paleo Stuffing – SO MUCH BETTER than any of that grain-stuffed, stuffing, ha ha!